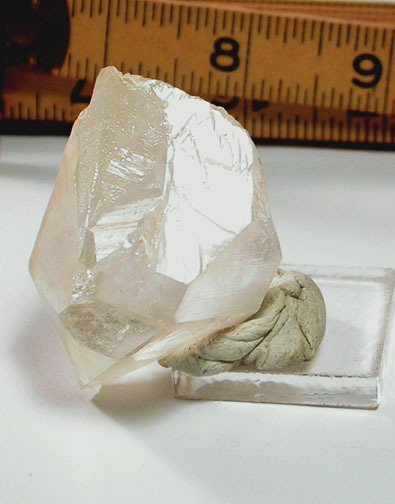 A hera, or self-healed crystal, which is also a healer. 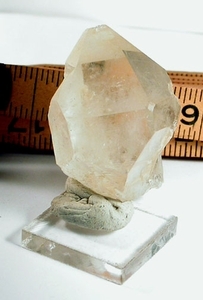 This Arkansas golden healer is nearly re-terminated at its' base, it has drusy in a growth crater, and several raised record keepers indicating self-repair to a 1/4" chip in back of the main face and another at a prism side. A tiny diamond window at the main, and a 'timelink to the future' around the side make this an 8h faced crystal, quite rare. Glittering, curved devic veils and champagne hue add attraction - you can cheer each other on.